At long last, NBC's forthcoming 'Hannibal' TV series exploring the partnership between FBI agent Will Graham and his secretly serial killer mentor Dr. Hannibal Lector announced its premiere date for Thursday, April 4, unsurprisingly in the timeslot recently vacated by dud doctor drama 'Do No Harm.' Now, to commemorate the announcement, NBC has released our best look yet at the iconic titular serial killer, doing what else but serving up a feast! Take a look at 'Hannibal' and his suggestive decor inside! It'll still be a while yet before we get to check out the pilot episode of NBC's Bryan Fuller-helmed 'Hannibal,' but we're relieved to at least have an official premiere date, after NBC has previously hedged about when the series might debut. 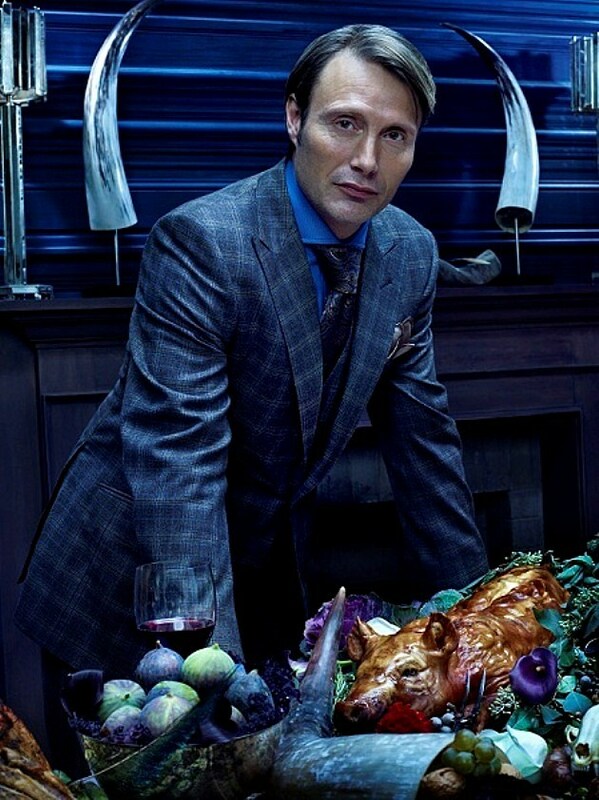 Accompanying the April 4 premiere announcement is that of a new full-length poster for the series, which features Mads Mikkelsen's Hannibal Lecter serving up a delightful dinner, albeit one flanked by his creepy horned decor somewhat reminiscent of devil horns. In addition to its title character played by Mads Mikkelsen and Hugh Dancy’s Will Graham, ‘Hannibal’ boasts appearances from ‘Dead Like Me’s’ Ellen Muth, Lance Henriksen and ‘The X-Files’ star Gillian Anderson, Laurence Fishburne and spouse Gina Torres playing Jack Crawford and his wife, ‘Veep‘ star Anna Chlumsky, comedian Eddie Izzard, ‘SNL‘ alum Molly Shannon, ‘Pushing Daisies’ vet Ellen Greene, ‘Wonderfalls’ star Chelan Simmons, Lara Jean Chorostecki as a female interpretation of ‘Red Dragon’ character Freddy Lounds, and Raul Esparzaas Dr. Frederick Chilton. Set in the early days of Will Graham and Lecter’s partnership, Fuller’s envisioned series is said to be “a love story” told across at least seven seasons. We’ll keep you posted on the latest from ‘Hannibal,’ but in the meantime check out the poster below, and tell us what you want to see from the Bryan Fuller series in the comments!